Here are simple healthy eating tips that are guaranteed to save your waist line when dining out! When you're a busy mom or a busy person in general, it can be difficult to get meals on the run. That's why these healthy eating tips are so important to your family's health. One of the most tempting things to do when you're running errands all day is to grab something at a fast food restaurant. This is especially true if you have kids tagging along crying "I'm hungry!" Fast food is the quickest and easiest route to fill everyone's tummy, but it isn't necessarily the best one. 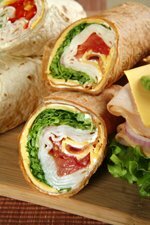 There is hope that you can still eat healthy no matter where you go if you follow the healthy eating tips listed here. And, no they aren't all that restrictive or boring. Make the least damaging food choice and watch portion size. Okay, you're stuck at McDonald's and the smells and the sites are getting to you. Do what I do… scare yourself into making the right choice! -Ordering from the kid's menu or the dollar menu. Both of these have smaller portions, and you do not have to say you are buying it for a kid. -The kid's menu now offers sliced apples instead of fries and milk instead of soda, making it easier for you to make healthier choices for you and your kids. -(Number 1 recommendation) Order a salad, yes I know it's not as fun as those wonderful fries which, are the best at McDonald's, but you will feel so much better physically and mentally if you make a healthier eating choice. Ordering a salad is the number 1 recommendation because fast food is addicting. This is a sad fast food fact, but the more fast food you eat, the more your body will crave it. You want to break the cycle and get off the fast food track and order a salad. I'm not kidding, it's a vicious cycle that needs to be broken. Learn the fast food facts and go to McDonalds.com for nutritional information on each of their food items. For instance, a double cheeseburger is a better choice than a Southern Style Chicken Sandwich because the double cheeseburger has a lot less calories. The Chicken sandwich has a lot more sodium as well. Plan, plan, plan your meal before you go! You can find most restaurant nutrition facts online. Pull up the nutrition facts of the place where you are going to eat and decide right then and there what you are going to eat. Restaurant nutrition facts will allow you to look at the fat, carbohydrate, sodium, and protein of each food listed on the menu so you can make the best choice for your healthy eating plan. 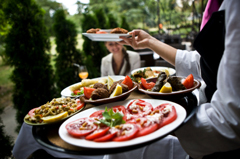 If you eat out a lot, you will definitely want to use these healthy eating tips. When you are following healthy eating guidelines it is a good idea to make your food choices green and lean. What this means is you'll have more vegetables and a lean protein and no bread! Most of the time bread at a restaurant isn't that good, so skip it and use the tips we've all heard if it's too tempting… "have the waiter remove the bread basket." This will give you a good meal and give you the protein and greens that you need. Don't be afraid to ask questions and tell the waiter how you want your meal prepared. Don't even open up the menu! No, I'm not kidding. Just order from your head. For example, "I'd like an egg white omelet, prepared with NO butter and NO oil, stuffed with veggies and leave the feta cheese on the side please." As always, be nice when requesting things prepared a certain way. Just be sure to tell them you cannot have butter or oil and that will save you a ton of calories. Do the same when ordering meats, NO butter and NO oil. I sometimes get a strange look from the waiter when I order this way, and my husband always follows it up with a smart aleck comment like, "She'll literally blow up if you put either of those on her food." If you're embarrassed to ask for things prepared a certain way, just tell the waiter you're allergic to this or that and they will understand and comply. But, if you don't eat out a lot and it's a real treat to go out, then by all means, if you've behaved and ate healthy all week, go for it! Enjoy yourself within the constrains of moderation because you will feel pretty bad physically and mentally the next day. Don't panic if you overdo it eating, just know that it's water weight and you'll lose it as fast as you gained it if you get right back on your healthy eating program. For more great information on healthy eating tips check out www.eatright.org. This is the American Dietic Association web site which is world's largest organization of food and nutrition professionals and offers a ton of healthy eating tips! To see how much food and what foods you need each day, check out www.mypyramid.gov This is another excellent web site full of healthy eating tips and designed to help you make healthy nutritious food choices and up your activity levels. Incorporating these healthy eating tips in combination with nutritional information that is readily available on the Internet, will help you make the most optimal nutrition choices for you and your family.